Espionage, betrayal, scandal — only Ian McEwan could put these things in a novel and make them kind of slow. But Sweet Tooth, the author’s 14th book, is a pensive, literary spy novel. I should clarify: It features spies talking about literature during the Cold War. “Sweet Tooth” is the code name for an MI5 outfit with the goal of funding artists all over the world whose political opinions fall in line with those of the British government. Serena Frome is a spunky recent Cambridge grad whose presence at the agency can best be described as “disruptive” when she falls for Sweet Tooth–endowed author Tom Healey. She’s in love with Tom’s fiction, and since her identity is undercover, Tom is unknowingly in love with Serena’s fiction as well. I’ve read quite a bit of McEwan’s work, but because he writes women so damn well I was surprised to learn that Sweet Tooth features his first female narrator since Atonement. Serena is attractive, and able to play her charms both to her benefit and to her detriment; her confidence masks a tenderness in her psyche. (For those who’ve seen Atonement’s film adaptation, you can also imagine Serena as played by Keira Knightley.) After the disastrous escalation of the novel’s central affair, Serena admits, “For all the mess I was in, I didn’t know how I could have done things differently.” McEwan plays with her self-awareness, and in a way, the reader’s. As is often the case with McEwan, there’s a twist at the end of Sweet Tooth, in the vein of Atonement and Enduring Love (though it’s not quite as powerful). But Sweet Tooth is a slyer, funnier novel than McEwan has written in years. More important, a literary giant is back in full form. Remember that trend of major newspapers publishing slideshows of decaying Detroit? Culprits included the New York Times, The Guardian, and Time, which did it not once but twice. Detroit was on display as a city in ruin, an example of urban decay rotting from a core of corrupt government, abandoned industry, and a lawlessness that resulted in the highest rate of violent crime in the country. 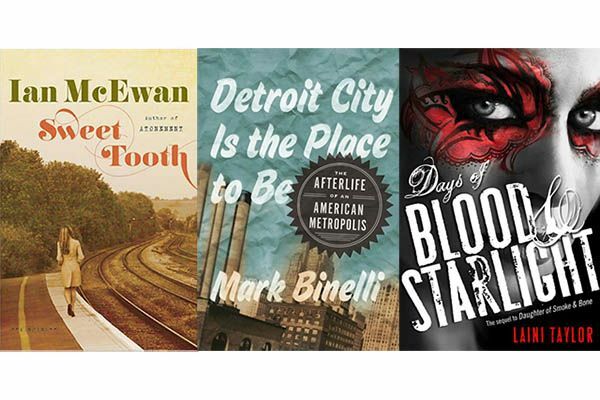 Detroit City Is the Place to Be doesn’t shy away from these unflattering realities, but it is a far more thoughtful exploration of what it means to be a fallen city. In a sense, it is the antithesis of those lazy slideshows. Mark Binelli, Detroit native and Rolling Stone contributing editor, has penned an impressive portrait of the city, balancing gumshoe research and interviews, some brisk but thorough history, and a nice dose of personal narrative. Even as Hurricane Sandy approached, New Yorkers seemed to believe that the city was weather-resistant, stubbornly invincible. (Before it was updated, this Times article was titled “Wine Glasses in Hand, Red Hook Renegades Defy Warnings.”) In contrast, Detroit is a city with a tendency to burn down. It will burn time and time again, always ready to rebuild itself into something new. Binelli points out that Detroit’s motto, Speramus meliora resurget cineribus — “We hope for better days; it shall rise from the ashes” — is enduringly appropriate throughout the city’s history, both literally (major fires in 1805, 1863) and metaphorically (the recession, the Lions this season). But signs of post-recession vitality are already appearing. Local artists have painted foreclosed homes in shades of neon and thrown raves in abandoned factories, a nod of both self-awareness and a “creative reclamation of negative space.” In that way, Binelli writes, “Detroit had become a DIY city unlike any other, the kind of place where regular civilians took it upon themselves to tauter the civic slack.” He makes a strong case that Detroit is America’s most compelling, most resilient metropolis. TL;DR: A humanizing look at the setting of Robocop. Here’s what I believe: Young-adult novels currently represent the most exciting books in genre fiction. Whereas a lot of adult literature is dense and unwieldy, young-adult books tend to focus on the most basic tenets of storytelling: strong characters, rich settings, and classic narrative arcs. And though the market is flooded with new teen novels (with disturbingly similar covers), it’s one genre that has attracted more talent and creative risk than any other. So that was a lot of throat-clearing to tell you about Laini Taylor, who is one of the best writers in the biz (also a National Book Award finalist). Days of Blood and Starlight is the second entry in her critically adored Daughter of Smoke and Bone trilogy, about a 17-year-old art student named Karou who falls in love with an angel (bear with me). Their romance is pinned between our Earth and a richly imagined parallel world where seraphs have long been at war with chimera, beings who have physical attributes of both humans and beasts. Taylor imbues her universe with brilliant touches of mystique and strangeness: For example, Karou travels the world collecting teeth to create new bodies for fallen chimera. Blood and Starlight takes place a few months after the first book, which ended on a stunning betrayal and a heartbreaking cliffhanger. You’ll have to start with Daughter of Smoke and Bone, since Taylor throws you right into the thick of things (I had to go back and reread a bit of it to keep characters straight). Even though it maintains Taylor’s knack for witty dialogue, this sequel is far darker and more violent. Karou is aiding the rebellious chimera under the leadership of an ambiguously motivated general, while Akiva (the angel) is fighting to make amends for his past sins. When questioning the motives of the seraph/chimera war, Karou asks, “What do you see when you look into the future?” In a lot of ways, this uncertainty encapsulates the adolescent experience and the strength of young-adult fiction’s recurring central conflict: Teenagers have to make difficult choices for which the consequences are unclear. When I finished Days of Blood and Starlight, I, too, found myself wishing I could see into the future, because the book ends on another terrific cliffhanger. TL;DR: Young-adult fantasy’s Empire Strikes Back without the vaguely incestuous romance.